Chemists have been told by the NHS to check whether young children are in urgent need of adrenaline pens before dispensing the devices. Pharmacists must ask parents and carers how many auto-adrenaline injectors they have before deciding how many to give. Only children who have no pens – including expired but usable devices – should get the standard prescription of two pens, the guidance says. It follows a shortage of EpiPens, the adrenaline pen most often prescribed. The new NHS guidance to pharmacists and dispensing doctors relates to 0.15mg pens, prescribed to children who weigh less than 25kg (four stone). The Department of Health told the BBC’s Victoria Derbyshire programme new supplies were “expected within the next week” and patients with the greatest need would be prioritised. People are recommended to keep two of the devices with them at all times for cases of anaphylaxis – a severe and sometimes life-threatening reaction often caused by allergies – as one is not always enough. They can be used only once and usually have an expiry date that lasts for a minimum of 12 months. 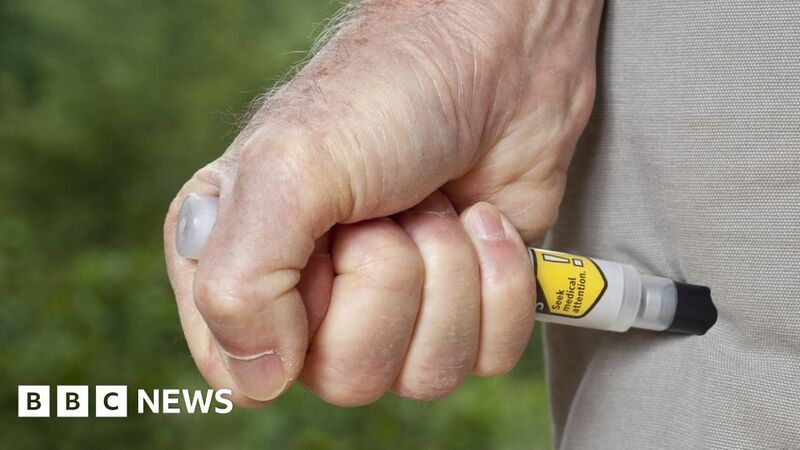 A global shortage of EpiPens has had a knock-on effect on the alternative brands of auto-adrenaline injectors, Jext and Emerade, which are now also in short supply. The new guidance from the NHS says a “critical supply issue” for 0.15mg pens means they need to be conserved for those who “truly need them”. It says pharmacists and dispensing doctors must follow a flowchart of questions, or a “validation protocol”, before dispensing the pens to patients, “other than when there is an immediate clinical need”. The flowchart involves checking with parents and carers how many of the devices the patients have, including expired ones that are not discoloured and do not contain particles. Pens kept at schools and nurseries are not included. The guidance says: “The purpose of the validation is to ensure that every eligible patient has at least one in-date device and that a situation is avoided where some patients have two in-date devices, whilst others have none. The Department of Health and Social Care said that if no new devices can be obtained, expired pens can be used in an emergency, “as this is safer than not using them”. The department says expired devices, as long as they are not discoloured, containing particles, or showing other signs of damage, will not be dangerous but the potency of the adrenaline may have reduced. It comes as the Medicines and Healthcare products Regulatory Agency (MHRA) agreed to extend the use of some batches of 0.15mg and 0.3mg Jext AAIs four months beyond their labelled expiry dates. The extension applies to only the devices listed here. Other AAIs should not be used after their expiry date without first checking with your medical practitioner. The Jext devices will continue to “work safely and as intended” within the extended use-by date, the MHRA said. ALK, the company behind Jext, said it had “significantly increased production” of its AAI devices in the wake of the global shortage of EpiPens. However, the time needed to manufacture its products, along with the scale of the demand, meant it had not been able to meet the shortfall so far. The extension granted by the MHRA follows its decision last month to agree for some batches of 0.3mg EpiPens – for those who weigh more than 25kg – to be used past their normal use-by date. In both cases, the medicines regulator said it had agreed to the requests, made by the producers of the devices, after reviewing evidence on the drugs’ shelf lives. A Department of Health and Social Care spokesman said: “We are working closely with all the manufacturers of adrenaline auto-injectors to improve the supply situation as quickly as possible. “Guidance has been given to patients, their parents and caregivers, to explain what they should do if they need a new auto-injector device.